Squash House Quilts: Almost Time for Colors! How many of you have had the opportunity to see a Colors Ceremony? Every branch of the military marks the end of the day with a ceremony in it's own way. When we lived in Everett we could often hear colors presented at the Everett Naval Base at sundown. It was wonderful to hear the bugle tune - Evening Colors - wafting up to our house in the late evenings. We've also been in other places - particularly some marinas that have their own version. Soon we'll have our own "flag" to present Colors at the Squash House! 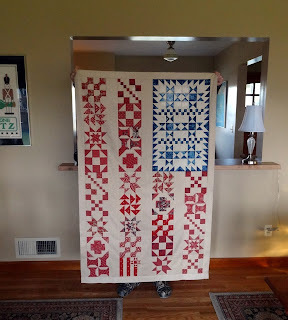 Yesterday I finished the top for my Old Glory quilt. I am so pleased with the entire quilt. I love that fabrics from a variety of French General lines and The Morris Apprentice line played so well together. Mr. Squash stood at attention while holding the quilt for me to photograph! He is very proud of his service to the Army as a young enlisted man. Check out his Crocs (you can enlarge the photo) - they are even in Camo! Soon I'll load up the quilt on Vinnie and get it quilted and bound. I haven't quite decided what to work on next, but I'm sure I can find something in my growing stash! Oh my, Candace - cheers to the Red, White and Blue! Giving thanks to all our troops. You have represented them well with this beautiful flag quilt! Look forward to see how it's quilted. 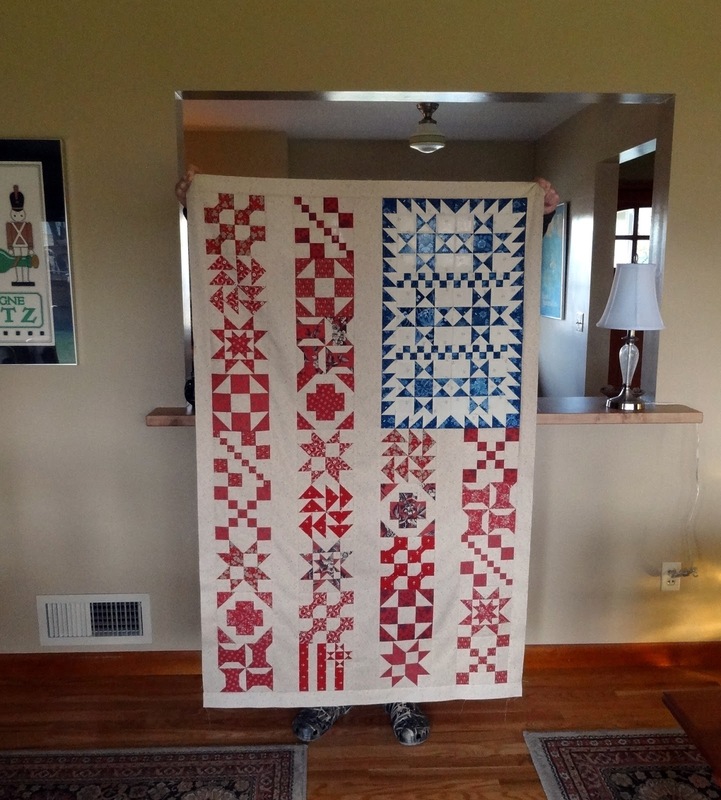 The most spectacular tribute to a flag quilt I've seen yet. Nothing makes the heart swell with pride like men in uniform and a military ceremony. This is an amazing quilt Candace. This is the most beautiful flag quilt I've seen. There's another one to add to my quilt bucket list. P.S. Love the crocs! I just started following your blog this week and already I want to make something I have seen here!!! What is the name of the flag pattern??? Spectacular!! Candace, I LOVE it! The fabric you ordered must have worked? I really need to get this pattern - wonderful!! Oh, so pretty, I love anything in red, white and blue! I love 'Colors' It's such a wonderful sight to see men and women stop whatever they are doing, stand at attention during colors. Your quilt is a wonderful tribute to that daily ceremony. BRAVO !!! 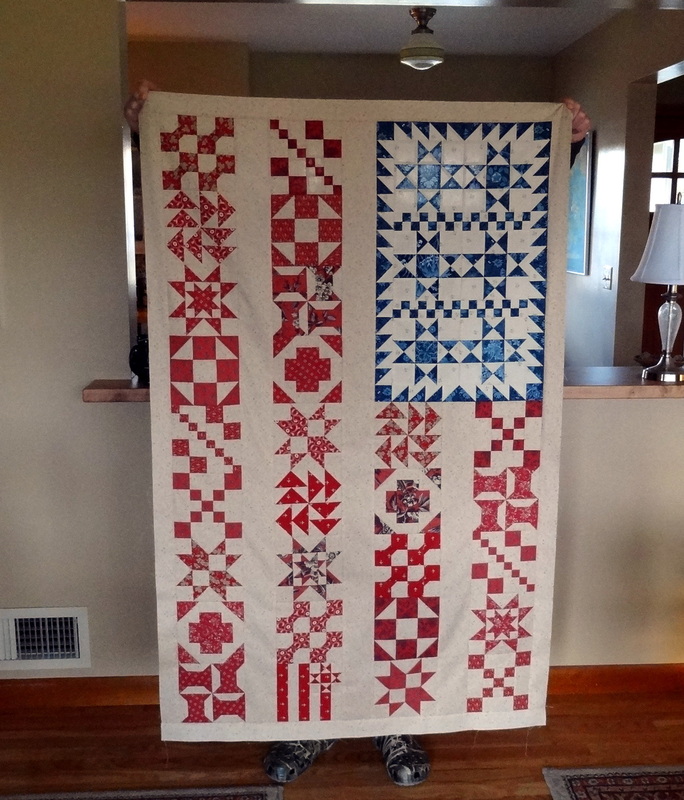 Your American flag quilt is Amazing !! Looking forward to seeing how you quilt it . Maybe it is time to make Swoon ? 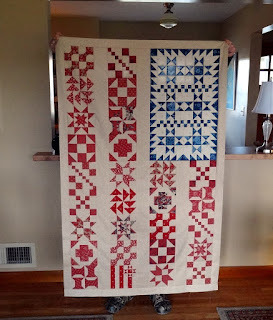 Love this flag quilt - it is fabulous! Perfect quilter's tribute. I love your tribute quilt. It is amazing! Our troops and veterans are extraordinary men and women! That couldn't be prettier, Candace. I love the quilt and the tribute to all our veterans! Can't wait to see it all quilted and bound. That is such a wonderful idea. Would you mind if the idea was stolen? what a beautiful pattern and I love the colors,,, did you make that from all of your stash? Stunning and unusual Candace. I really like how old style blocks can be used in such a new to me way. Gorgeous quilt Candace! I've not seen a flag quilt designed that way before. It's a beauty! It is incredibly beautiful! The layout of the two color blocks gives it a wonderful look and the tiny blocks are too cute for words! I have this pattern and am considering getting a group started for a sew along at my LQS. I thought I could break it up into sections and do tutorials on using the Easy Angler, what do you think? The piece is fabulous all finished up, and thanks to your hubby, veterans rock! I love it! I'm an Army brat, so it brings back fond memories for me. I love your flag quilt, Candace! It's just wonderful. Beautiful! And thank you, Mr. Squash, for serving our country. Thanks to your husband for his service to our country. Love the crocs, I wore my red ones yesterday.very good jo on the quilt! Will look forward to seeing it quilted! Not much more to say than Inspiring. What a wonderful tribute! I'm with Lynn...add it to my bucket list! Absolutely beautiful! I think I need to get this pattern! My older brother was a Marine and served in Vietnam. I have to make this quilt for him for his birthday. I think he'd be blown away. Love your flag quilt! And hmmm, I do have both the French General and Morris Apprentice fabrics...Is there a pattern for this or is it your own design? It is absolutely gorgeous! Please thank Mr. S for his service; love the military and all they do for us. That is just beautiful! I have that pattern and really want to have mine done for this summer! This is really beautiful - yyou'll treasure it for years. That's so nice! I love the colors too....all the time. I have an Ohio Star I made with r,w, & b and have used it as a table cloth during 4th of July for several years now. Still haven't had it quilted but will get that done this year. Something light and thin so I can put it on the table when I want to. It says, "Love this country!" loud and clear, just like your Colors. Thank you, Candace.